What are Adult League Alerts! Adult League Alerts! are emailed primarily during the Adult League Tennis season to keep players, captains and facility coordinators current with all adult league information, deadlines, etc. See the current Adult Alert! In order to receive our Adult League Alerts!, you must sign up to receive BLAST!, our monthly e-newsletter. Don't worry, we will NEVER sell, loan, rent or otherwise share your email address with anyone. 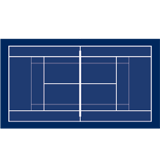 Be sure to add support@coloradotennis.com to your address book to make sure you receive your e-newsletters from USTA Colorado.